When it comes to government, it's not death and taxes, it's DEBT and TAXES. The City of Asheville faces $110 million in capital improvements projects that will be financed through municipal debt which will be paid for by city taxpayers, adding to our tax rate and tax bills. With increases in city fees and charges for all services despite population growth that has remained steady, what is fueling our debt and taxes? As, mentioned in our last article, "How did Asheville become so indebted?" the City's capital improvement project budget saw a 148% increase in 2014. Analyzing the capital improvement projects before and after that time reveals the City's priorities, a 2.2 mile stretch of road for a project called RADTIP, New Belgium and Greenways. (RADTIP is the 2.2 mile road construction project along the French Broad River in the River Arts District for which New Belgium was a catalyst. 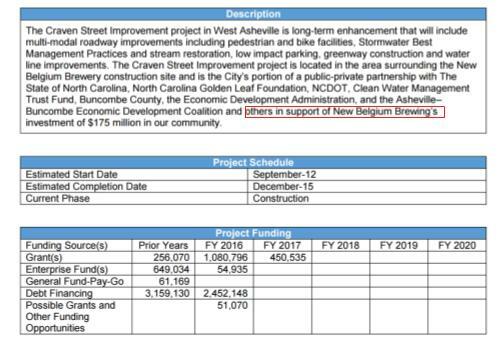 The Craven Street improvements and projects were part of the economic development deal the City made to incentivize New Belgium to choose Asheville. Some of the Greenways are part of the RADTIP project). That represents approximately 32% of the debt that City taxpayers will be paying for. These priorities, like Greenways, are no surprise when many of the City leaders (both present and in the past 4 years) are cycling enthusiasts. (Our city manager, Gary Jackson, is a professional cycler with a local team and many council members are avid cycling enthusiasts). Greenways were budgeted a mere $1.7 million in 2013. The remaining projects are the standard city maintenance and capital improvement projects such as affordable housing, sidewalk improvements, park maintenance and building maintenance, etc. This is the real CIP. That amount is $64 million which is what the City taxpayers would have been paying for if the City had not dramatically increased its Greenway budget and approved the 2.2 mile road project along the French Broad River. The $64 million of normal capital improvements project is actually on pace. In 2013, the City's total capital improvement project 5 year budget was $53 million, a $7 million increase over 2012. Three years later, an $11 million increase is on track. 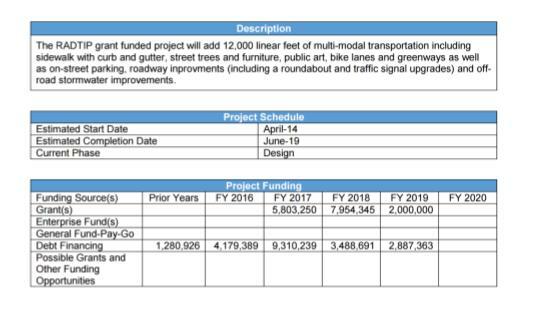 The CIP budget got way off track when the RADTIP project, Craven Street improvements for New Belgium and Greenways were added. Asheville Art Museum - In 2013 the City raised the tax rate on citizens to raise $2 million for the Asheville Art Museum renovations. This money has yet to be spent and is still on the books. More on this issue in a later article. Dr. Grant Southside Center Phase II was on the books 2012. It was originally budgeted at a mere $350,000. However, it disappeared after FY 2013 and has not been seen on a CIP budget for FY 2014, 2015, or the most recent 2016 budget. It could have been lumped into what was then called "Southside Improvements". It recently came back up in the headlines because it was one of the projects identified for the $74 bond referendum at a cost of $4.65 million. Eagle Market Street has been on the books since 2014 at a budget of $3.9 million. It keeps getting rolled to the following year. Charlotte Street Improvements was added in 2014 and is budgeted to get some improvements to the tune of $1.2 million. The City passed a $74 million bond package this past November which will cover the amount of municipal debt the city needs to finance these projects. It had to do so because, in its own words, the budget was "at capacity" but why? The necessity of the bond referendum was driven by the additional $31 million it needs to complete the greenways and road projects in a 2.2 mile stretch of road along the French Broad River in the River Arts District. Would taxpayers have approved of a bond package for that? With recent County revaluations showing 30% and more in property values, can taxpayers afford more? 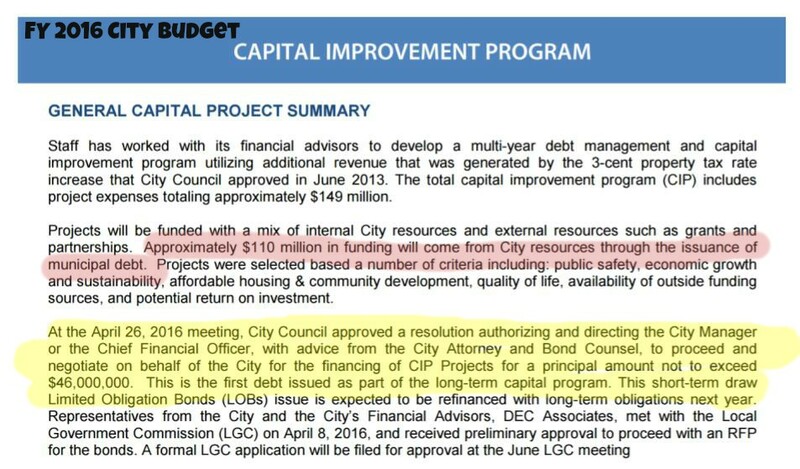 NOTE: The following is a list of capital improvement projects that have been identified by the City as needed "debt financing". These amounts are exclusive of grants, meaning even with getting grants, they will require financing by the City. 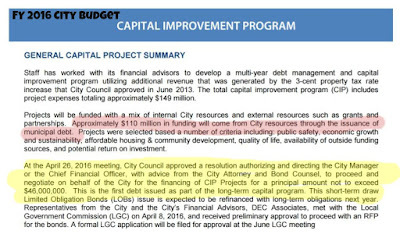 For full description of each project, see the City's budget, beginning at page 140. How did Asheville become so indebted?